So, it looks like the rumor mill was on the right track all along: Intel just announced a new Atom processor made with tablets in mind. Codenamed "Bay Trail", the quad-core chip is built using 22nm manufacturing process, meaning that high efficiency and low power consumption are more or less ensured. And when it comes to performance, at least a two-fold increase in computational power over current-gen Atom processors (aka Clover Trail) is being promised. Further details about the new Bay Trail Atom processor remain scarce, but plenty of presumably accurate information about it leaked back in November. Its maximum clock frequency is said to hover around the 2.1GHz mark, while the maximum display resolution it supports is 2560 by 1600 pixels. New security features have been implemented as well, although Intel does not elaborate on the matter. When we might expect seeing the Atom Bay Trail processor inside a mobile device we can buy? Well, we will have to wait, whether we like it or not. It is planned for the first tablets powered by it to launch later this year, in time for the holidays. 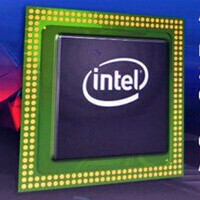 Hopefully, we'll learn more details as to what Intel's new processor is capable of by then. What is the gpu baytrail uses? That is a good question. I always think that this is the weakest spot when it comes to use intel processors. Sadly they didn't mention the GPU. 7th generation Intel graphics. That is Ivybridge graphics. It just crossed my mind... Will or can Bay Trail be enough to compete with other processors like Nvidia's Tegra 4 that was recently announced? Time will tell. We are counting on you PhoneArena in fair review.